Tampa, September 27, 2016—NewTek™ the leader in live IP based production tools and Vizrt the leading provider of studio automation tools for the digital media industry, today announced their collaboration on IP based newsroom solutions with Vizrt’s studio automation systems operating with the full line of NewTek live production professional products, including the NewTek IP Series. "We designed our studio automation system to give broadcasters a flexible and easy way to deliver complex live productions,” said Petter Ole Jakobsen Vizrt CTO. 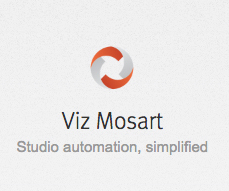 “Vizrt has developed an IP structure that allows our customers to choose the best IP workflow for their needs. By combining our studio automation system with the versatility of the NewTek line of live production solutions, media companies have a new native IP workflow for all aspects of the production." Broadcasters will have the opportunity to learn more about the Vizrt's studio automation and NewTek IP product integration, at the Viz Mosart Summit on November 17-18. All automation enthusiasts are welcome to Frankfurt where Vizrt and the German broadcaster Hessischer Rundfunk (HR) will be hosting this user-driven gathering of broadcasters.